OpenNMS provides a range of management options, from simple to complex, and it's available for both Windows and Linux environments. Customizable dashboard options are a plus, but configuration can be tricky. Zenoss Core stands out for its flexible reporting and wide range of preconfigured plugins, however it's only available for two versions of Linux. The multi-platform NetXMS runs on Windows, Linux and UNIX versions including BSD and Solaris. It's easy to install but lacks a commercial version. Sensu Core, too, features a wide range of available plugins along with a flexible architecture that scales well. Its dashboards and reporting capabilities leave room for improvement, however. Individual reviews of each product follow (scroll past product chart). OpenNMS is open-source software available for installation on both Linux and Windows servers. It’s available in two different versions, Meridian and Horizon. Horizon is released on a more rapid schedule and contains the latest available features, while Meridian is a longer-term release (about every 12 months) that does not incorporate the latest features until they have proven stable in prior Horizon releases. Horizon is free to use, Meridian is subscription based and geared towards organizations that require a stable, long term release and professional support. For this review we tested Horizon version 22.0.3. Although the installation steps vary depending on the operating system, we found it easy to install on both Windows and Linux. The only prerequisites are the Java SDK and, for Windows, also the PostgreSQL database. The system requirements call for a dual-core CPU, with 2 GB of memory and 20 GB free disk space, although this is obviously the bare minimum and would likely be insufficient for enterprise use. For our Linux installation, we opted for the quick install, but OpenNMS also provides step-by-step instructions for a more customized installation. After installation we launched the Web interface. On first launch, the user is presented with a well-organized start page with multiple "dashlets," which graphically represent information about the network infrastructure. Alternatively, the start page can be customized as a single panel, or you can create multiple panels or boards to organize information into logical or geographical groups. Although initially we found the vendor’s terminology a bit confusing with dashlets, ops boards and panels, eventually it made more sense. Dashlets are available in different formats such as alarms, topology, charts, maps, and images. There is also a heat map feature that can be configured to display ongoing outages and alarms, sorted by entity and service impact. OpenNMS also provides a surveillance overview that delivers an aggregated matrix of all nodes and their status. You can group nodes into categories such as servers, routers and switches. 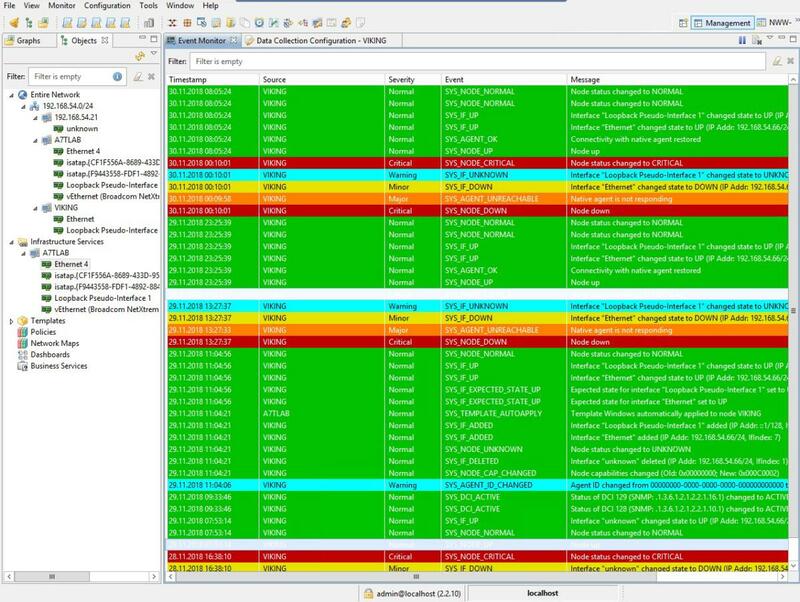 The surveillance overview is color coded with green for normal, yellow for warnings or minor issues, and red for critical issues. 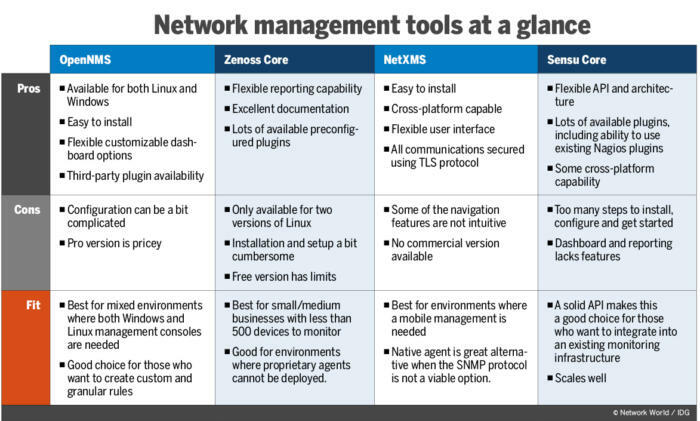 OpenNMS Horizon provides a myriad of monitoring options, and at first glance, the configuration options might seem a bit overwhelming. Thankfully, there are ways to get started without the need to wander too far into the configuration weeds. We started with a couple of basic monitoring items, which can be provisioned without the need to deploy agents or configure the node being monitored. One of our initial tests was to make sure our test Web server was running correctly, and the other was a simple PING test to see if a file server responded. By shutting down the various services, we were able to confirm that alerts were immediately triggered. OpenNMS has a discovery feature that is especially helpful when working with larger infrastructures. The discovery feature provides some granularity, so you can easily determine which nodes and services should be included or excluded by IP range. This feature discovered our test environment with less than 50 nodes fairly quickly but did take quite a bit longer to fully discover our production environment spread out over several geographic locations. OpenNMS is ideal for mixed environments where both Windows and Linux management consoles are needed. While the discovery feature will give you some basic information about the infrastructure, a deeper dive is often necessary to get more details. For these scenarios, OpenNMS can use other protocols like JMX, WMI, Syslog and SNMP traps. In addition, OpenNMS provides agents called "pollers" that can be deployed to nodes and end points. These are installed using a link from the main OpenNMS server, which launches a wizard to configure the end point. Many of the configurations can be performed using the Web interface, with details stored in XML files that can also be created and customized directly. A big part of any network management system is the ability to receive timely and informative alerts. In addition to the onscreen alerts, OpenNMS allows alerts to be sent via text and email. There is also an option to integrate with custom or third-party issue ticket systems. OpenNMS provides several pre-built reports that can be saved as PDFs or CSV. Custom reports can also be created using JasperSoft Studio. Free support for OpenNMS is available through online user manuals for installation, administration and development. There are also a few online video tutorials along with a Wiki that provide comprehensive step-by-step instructions for various management cases. The OpenNMS commercial version, Meridian, is available as an annual subscription at $6,000 for the first server instance with discounts for multiple instances. Support packages are available starting at $20,000. We found OpenNMS to be quite comprehensive with most of the features required for practically any enterprise environment. We particularly liked the flexibility in monitoring options from the very basic to more complex rules. We would have liked to see a less expensive subscription option for smaller commercial installations, but for most network installations we suspect the free Horizon version along with free online tutorials will be more than adequate. The one caveat is the frequency of updates with Horizon, which could potentially disrupt a running production environment. NetXMS, like OpenNMS, is multi-platform, open-source network management software. It's available for installation on Windows and Linux along with UNIX versions such as BSD and Solaris. In addition, the NetXMS Management Console can be installed on Linux, Windows, Mac and Android devices. For this review, we tested version 2.2.10 on both Windows Server and Ubuntu. The minimum system requirements call for a dual-core CPU at 1GHz, 1GB RAM and 1GB disk space, with additional disk space required for data collection. Both installations were easy to perform, but as is often the case, the Windows executable made it particularly easy to install. There are only a few options to pick during the install, such as selecting which database drivers to install and choosing the administration tool options. NetXMS can use most common databases, including Oracle MySQL, MS SQL Server and PostgreSQL. As part of the install you can also configure the network auto-discovery options, a feature we enabled on one of our installs. The management console installed on our Windows server was a desktop application. We were first presented with what NetXMS calls the "workbench window." This provides different views, which are basically different ways to view the network infrastructure, ranging from a 30,000-foot macro view down to the details of a particular network device or event. By arranging a set of views on the ‘workbench window’, you can create and save custom perspectives. The perspectives can then be loaded from a quick access menu, providing custom displays of the network infrastructure. 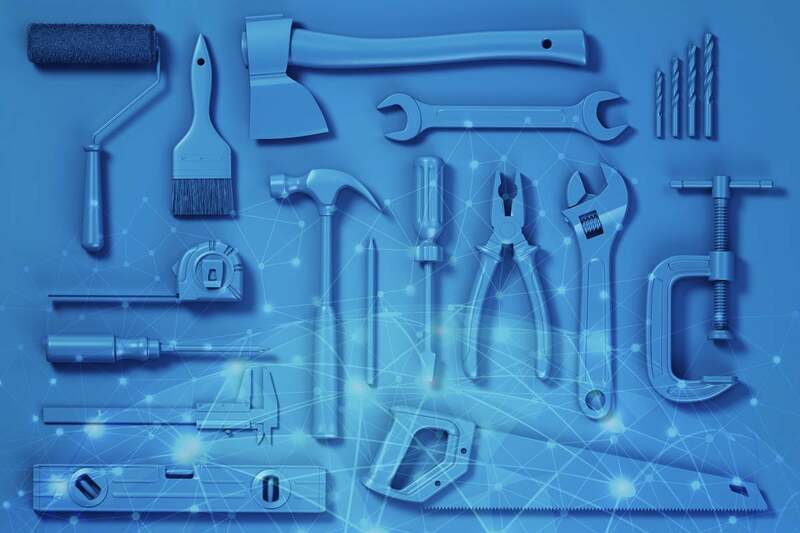 The NetXMS Object Browser, which displays the entire network as a tree structure, makes it easy to quickly drill down into the network infrastructure. It also displays a status indicator, ranging from ‘normal’ to ‘critical’ status, making it easy to identify problematic nodes or protocols. NetXMS is multi-platform open-source software, available for installation on Windows and Linux along with UNIX versions such as BSD and Solaris. At first, the auto-discovery of our network infrastructure did not yield much in the way of results, with just one lonely Windows desktop computer discovered. However, by switching from passive to active discovery, NetXMS was able to easily discover additional network nodes. Together with custom scripts and application specific extensions, NetXMS can use all versions of SNMP along with SSH and ICMP protocols to collect data. For additional firepower, administrators can deploy the NetXMS agents when feasible. Agents are available for Linux, UNIX, Windows and other platforms, and can be deployed to a variety of devices. Depending on the type of device, the agent can be installed with various sub-agents. For example, with the Windows agent you can add sub-agents that provide UPS or log monitoring. Once installed, the agent will start uploading information to the NetXMS server. The agents can be reconfigured if needed, either directly on the client machine or remotely from the server. For most settings, the agent configuration details are stored in XML format. It should be noted that our tests found the NetXMS agent to have a small footprint, using only a fraction of available memory and CPU resources on our test machines. As mentioned, NetXMS provides multiple ways to view the network infrastructure status on screen. Problem areas are easily identified using color coding; green for all systems go and red for critical issues. When a problem occurs, NetXMS can take various actions, such as sending notifications via email and text with detailed information about the problem. In addition, processing rules can be configured to take various actions, such as running a script to remedy a problem. There is great granularity in how these rules are configured and how issues can be escalated if not acknowledged and corrected in a timely fashion. NetXMS has a powerful network mapping feature that can be used to create custom maps of the network infrastructure. This allows administrators to see the status of a section or the entire infrastructure at a glance. By connecting the various nodes, details regarding network bandwidth and other resource utilization can identify potential bottlenecks. For networks with more than one physical location, the nodes can be drawn on a geographical map. You can also create custom dashboards with graphs, speedometer type dials, and other visual aids to represent network performance. For additional reporting, there is an optional reporting module built on the commonly used Jasper Reports library. NetXMS provides up to date and easy to use online user manuals, available both as HTML and downloadable PDFs. There is also an online forum and Telegram-based messaging group. Unlike other products we tested, NetXMS is only available as free software with no commercial version available. Paid support options give customers access to expedited technical support via phone or email. Paying customers also receive custom hotfixes as needed along with priority bug fixes. NetXMS also offers custom training classes. 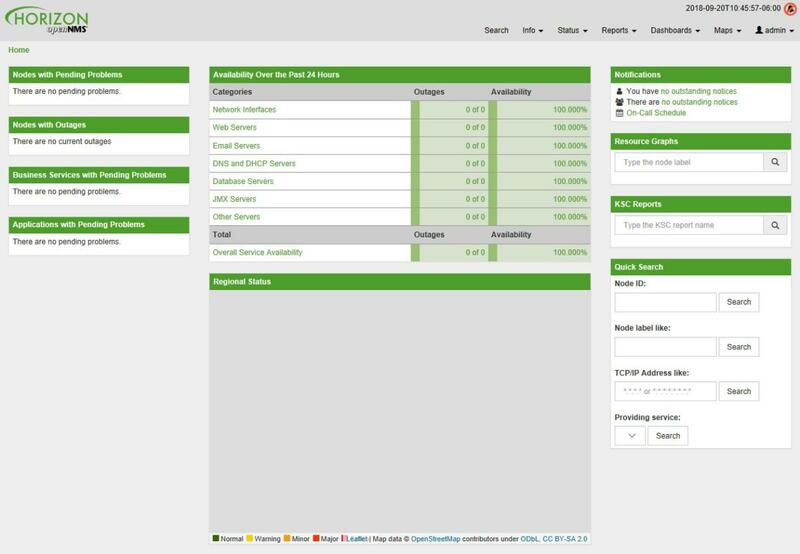 While the NetXMS management console is well organized and very responsive, there are some navigation features that are not optimal. For instance, when making changes to some of the settings, there is a tiny "disk" icon to save your changes. This is hard to see, and there's no warning if you forget to save your settings. These items could easily be remedied to make NetXMS an even better product than it is. In conclusion we found that NetXMS provides a complete network management application with a wide range of features that should fit most organizations’ needs.